The midfielder also says he did not deserve to be punished for his clash with Robert Huth. 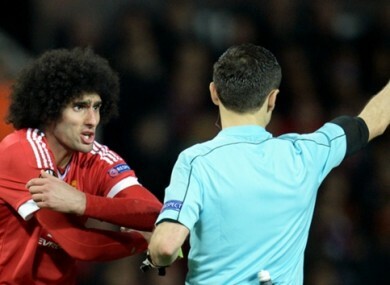 Fellaini: "If I had to listen to all the opinions about me, my head would explode." MAN UNITED MIDFIELDER Marouane Fellaini is adamant he is not a dirty player and has stressed he has never injured a player. The Belgium international has made the headlines for the wrong reasons on more than one occasion in 2015-16, escaping punishment after seemingly elbowing Emre Can and Roberto Firmino in the Europa League tie with Liverpool, before eventually receiving a three-game ban for the same offence toward Robert Huth in the Premier League match versus with Leicester City. Fellaini is available to return for United for this Saturday’s FA Cup final with Crystal Palace having netted in the quarter-final replay with West Ham and the semi-final victory over Everton. And Fellaini has made it clear he never has the intention to hurt an opponent, putting his actions down to his impulsive character. “Everyone has their opinion. If I had to listen to all the opinions about me, my head would explode,” Fellaini told the Daily Mirror. “So I just focus on my job, the manager, my team-mates, the club. “I know when I do bad and good. I’m not a dirty player. People can think whatever they want. I never injured a player. Never. Email “Fellaini: I am not a dirty player and have never injured anyone”. Feedback on “Fellaini: I am not a dirty player and have never injured anyone”.